Forgiveness is a Choice – CounselCare Connection. P.C. Forgiveness is not easy. It can be painful. Actually, from God’s perspective, forgiveness had a great price..the death of His one and only Son. But our forgiveness towards another human being doesn’t cost us our lives. It may cost us our pride, giving up retribution towards them and the loss of personal belongings. Certainly, you can forgive someone for past offenses but still hold him or her accountable for present responsibilities. Here are some guidelines and scriptures which will help you as you consider forgiving someone and letting go of the past hurts. a. Ask: What am I angry about? What is my responsibility? What is his or her responsibility? b. Use a soft, loving approach. Think about how much God loves you & has forgiven you (Ephesians 4:32; Psalm 103: 11-12). 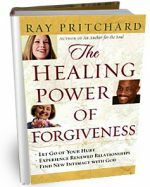 Read more on forgiveness at the What’s Good About Anger? site!